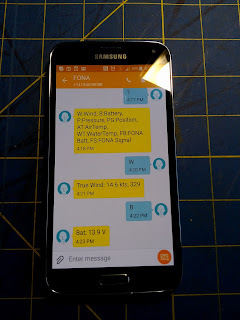 With a FONA connected on the Raspberry PI (where the NMEA Console is running), you can remotely monitor what's going on. The feature has been implemented - as usual - as a UserExit. This UserExit is in the Desktop repo, the FONA Java interface is here. Just by sending an SMS, you can retrieve the data read by the Raspberry PI on board, like True Wind Speed, Battery Voltage, Air and Water Temperature, etc, all you need is a smart phone that can send and receive SMSs.